Investing is an important aspect of our financial lives, but the fact is that women invest less than men. In this episode I speak with Andy Wang where we dig deeper into this topic of investing and he brings up some key points which you need to know about. Andy’s first money memory involved money he received from either a birthday or Chinese New Year. Upon receiving his new funds, Andy and his mother travelled to their local bank, where he opened his first savings account. After depositing $100, Andy was astounded by the immediate 0.04$ increase from interest alone. Years later, Andy got his first job working at the front desk of a tennis club at the age of 15. Andy grew up in a money savvy family. His father worked as the director of research at the bank of New York, was a keynote speaker, and ended up running the money management subsidiaries at the bank of New York. Upon entering 4th grade, Andy’s mother returned to work as a stockbroker. Dinner conversations often involved Andy’s father educating him and his brother on money equity and economic cycles. His father explained economic cycles using appliance updating as an example. Growing up, Andy did not dream of becoming a financial adviser, nor did he plan to work with his father and brother in a family business. During his college years, Andy interned at several brokerage firms. After graduating, Andy left New Jersey for Boston, where he worked at a financial services company, and an investment firm. After working a couple jobs outside of financial investment, he returned to Boston to work with his father. With his parents leading by example, Andy does his best to educate his own children on money matters. Andy explains how kids watch what you do likely more than what you say. When he started his podcast 6 months ago, Andy’s son approached him with a school project he had completed. The assignment was to finish the sentence “My goal is…”, to which Andy’s son wrote “have a podcast like dad.” Knowing his kids pay attention to his actions, Andy shares his mistakes, in hopes of teaching his kids the quality of learning from mistakes. Most members of Andy’s family-run company come from research analyst and portfolio manager backgrounds. Because of this, they mostly focus on investments and financial planning. Andy’s company follows two philosophies: Invest in quality, and know the financial weather. Invest in Quality: To Andy and his team, good quality means earnings. More specifically, consistent, steady earnings. By determining where the earnings are coming from, one can ensure the growth of their company’s earnings, and therefore, their stock price. Financial Weather: In the past, bear markets would occur approximately every 3 to 4 years. Currently, bear markets occur less frequently; about every 8 to 10 years. Because of this, many have forgotten to update themselves on the financial weather. Awareness of the next bear market allows for retirees and other individuals to prepare their finances for upcoming changes in the market. When it comes to investing, women and men have different tendencies. According to Andy, in general, men are more confident in investing, while women are more goal oriented and trade less. This is likely due to women having smaller nest eggs since they earn less. Women tend to participate in their employer sponsored retirement plans at a higher percentage, and once they set their allocation, are more likely to pick their target date funds which adjust automatically. This means they won’t need to worry about changes in their portfolio as they age. Women sit behind men when it comes to financial confidence. Not only is there a wage gap for women and men, there is also a gap in investment rates. In general, women invest less than men. 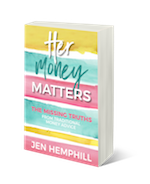 Men invest their money outside the 401k work plan, while women tend to save their money as cash that does not work for them. According to Andy, women who wait to invest their savings lose about $100 a day. Andy states education and communication are the keys to minimizing the financial gaps between women and men. With more knowledge comes power, and with more power, women would have more confidence in their finances. This episode is sponsored by our friends over at FabFitFun! 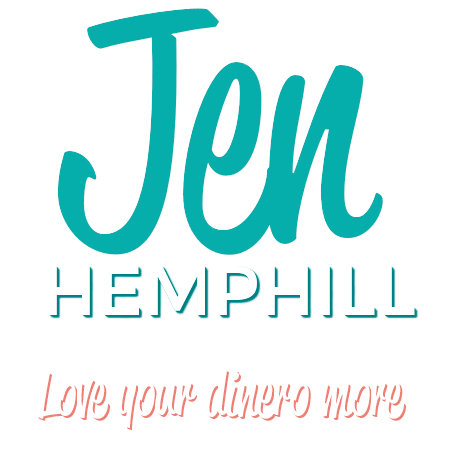 Use the code HERMONEY to get $10 off your first box over at www.fabfitfun.com. 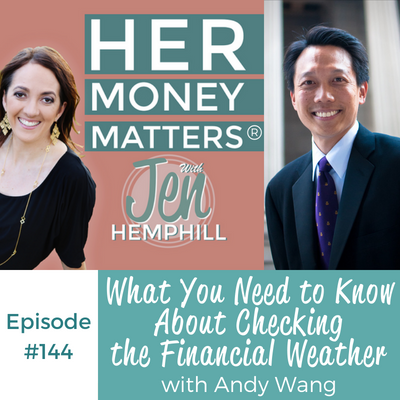 The post, HMM 144:What You Need to Know About Checking the Financial Weather With Andy Wang appeared first on the Her Money Matters Podcast.